"I hadn't realised, before reading this outstanding book, just how crucial the Polish contribution to [Allied] victory actually was. If it hadn't been for their pilots, for instance, we might well have lost the Battle of Britain..." --Henry Coningsby, Waterstones This fascinating book fills a yawning gap in our knowledge of the Second World War. By bringing in the personal reminiscences of people of all stations, the author gives pace and immediacy to this extraordinary story. 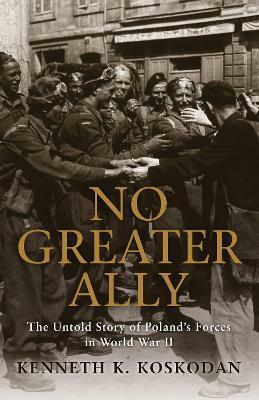 "Adam Zamoyski, author of Forgotten Few: The Polish Air Force in World War II"
No Greater Ally is an absolutely crucial contribution to the history of the Second World War. Anybody who seeks to understand the dynamics of betrayal and resistance as they apply to this period, in Poland, in Europe, must read this book. "Alan Furst, author of The Polish Soldier"
I hadn't realised, before reading this outstanding book, just how crucial the Polish contribution to [Allied] victory actually was. If it hadn't been for their pilots, for instance, we might well have lost the Battle of Britain... "Henry Coningsby, Waterstones"" ""No Greater Ally" is an absolutely crucial contribution to the history of the Second World War. Anybody who seeks to understand the dynamics of betrayal and resistance as they apply to this period, in Poland, in Europe, must read this book." -Alan Furst, auhor of "The Polish Soldier"
"This fascinating book fills a yawning gap in our knowledge of the Second World War. By bringing in the personal reminiscences of people of all stations, the author gives pace and immediacy to this extraordinary story." Adam Zamoyski, author of "Forgotten Few: The Polish Air Force in World War II"